Create both a User and a Contact for yourself, if these don't already exist in FinancialForce making sure the email matches your primary email in Expensify. Create contacts for each employee who will be submitting expense reports. Make sure each contact's email address corresponds with the email address on the employee's Expensify account. Click Create a New FinancialForce Connection, and you'll be redirected to login to your FinancialForce account. Once you login, you'll be redirected back to Expensify and the sync will start. 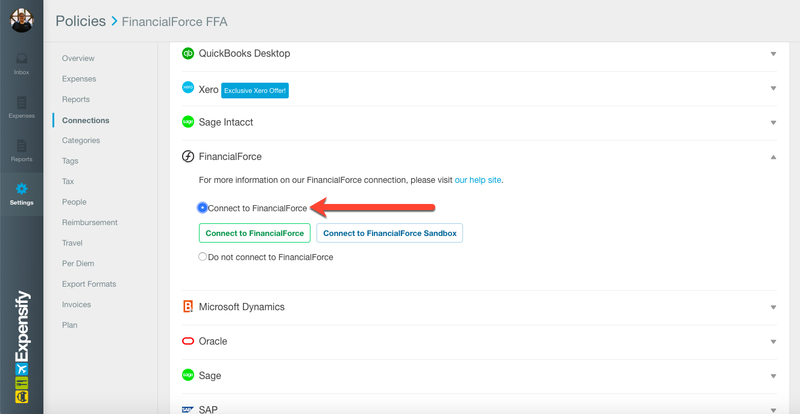 If you're already logged into SalesForce on another tab, to make the FinancialForce connection, the sync will start automatically.